If you want a blatant “slap in the face” about how little we understand brain chemistry, do what I did. Google on over to the Scientific American website (love this magazine). Now search for the term “THC”. At the time this post was written, the search returned 2756 references/articles. Just panning through the titles of these articles will quickly illustrate the confusing state of the industry around the use, effects, detractors, and benefits of THC. 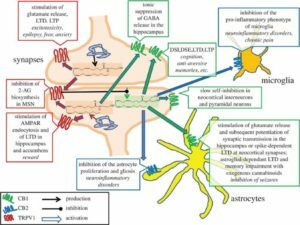 There are many factors involved, including the type of cannabinoid ingested, but the leading factors appear to be related to the various receptors in the body to which they bind, more specifically the G-Coupled Protein receptors. Further study of cannabinoid receptors has revealed the presence of two types of receptors CB1 (brain) and CB2 (immune and blood cell production). While these receptors are about 50% identical, there are certain differences with respect to their binding criteria. The optimal path forward would appear to be the ability to clearly delineate these differences and develop THC equivalents (natural or man-made) that can target CB2 reception over CB1, depending on the result intended (ex. pain management versus glaucoma versus seizure control). While we don’t recommend running out and buying THC, the promise of this until-recently frowned upon drug is intriguing and bears watching. Perhaps there will someday be a natural “hemp that helps” instead of hinders. Regardless, the brain continues to surprise on a daily basis.